Big Picture delivers video production and equipment services for the fast-turnaround, highpressure demands of concert touring, television, corporate events, live events, sports and outside broadcasts. Their gear list includes LED video walls, large scale projection, media servers, data recorders and rigging as well as camera equipment. Their brand new Panasonic camera suite includes ten AK-HC5000 4X high speed 1080p camera systems as well as two AJ-PX5000G high-end ENG camera recorders. The new cameras capably meet the demands of Big Picture’s booming production business. 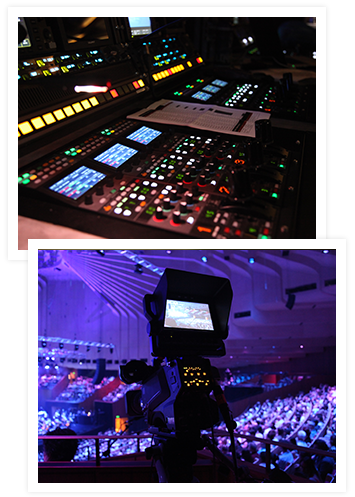 Deployed by Big Picture in late 2016, the Panasonic kit has been run up on a wide variety of jobs and environments during the busy events season – including the 5-week tour of the theatrical magic show Dynamo ‘Seeing is Believing’; 2CELLOS with the Sydney Symphony Orchestra which was recorded to DVD; the WWE NXT Downunder wrestling event for a US subscription channel; Australia Day celebrations; and the Sydney Gay and Lesbian Mardi Gras Festival. The key challenge of the 2CELLOS job was the separation between the Concert Hall and the control room. The lack of control room space near the Concert Hall and the absence of any SMPTE patch (panels) meant that Big Picture had to set their control system up in the Video Control Room on the other side of the central passage to the Concert Hall and remote the signals via the in-house Single Mode Fibre tie lines. Big Picture brought in a range of cameras to test before selecting the Panasonic solution, with the Panasonic cameras performing very well and coming out on top in most shootouts. The cameras also met Big Picture’s requirements in terms of flexibility, quality and ergonomics; as well as being head and shoulders above the rest when it came to support. Big Picture needed two RF Link cameras to complement their ten studio cameras so looked at options for ENG style cameras. The key selection criteria – ultimately met by the AJPX5000 ENG cameras - was that the RF cameras needed to be as rugged as the AKHC5000, deliver the same application flexibility and most importantly match the colour of the AK-HC5000 cameras. Big Picture is currently working with third parties to establish a 1080p RF system, and plans to have this up and running in the next financial year. Big Picture is an Australian owned and managed full service technical production and equipment rental supplier specialising in supporting the live entertainment, broadcast television and corporate markets with state of the art equipment and a wealth of technical experience for events of any size. Nick Bojdak’s experience in Broadcast Television and the Concert Touring markets has seen him take on a variety of roles for Big Picture. In his capacity as “master of all things technical”, Nick has been instrumental in the staging of some of Australia and New Zealand’s largest events, including World Youth Day, Tropfest, Big Day Out, Pearl Jam, Green Day and Coldplay and working on the world stage with the likes of the Black Eyed Peas, Rihanna and Lady Gaga.